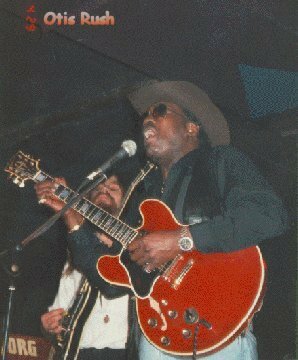 In the late 1950s and early 1960s, guitarist Otis Rush helped shape Chicago's West Side blues sound. Built on highly expressive guitar playing and an urban sensibility removed from the South Side's Delta-based blues sounds, the West Side blues school featured not only Rush but also Magic Sam and Buddy Guy, two other premier blues guitarists. Despite his contributions to Chicago blues, Rush has been, for the most part, under recorded and under appreciated. Only among fellow blues musicians and serious fans does he remain a major blues figure, whose emotionally charged solos, achingly plaintive chord phrases, and careful attention to textural detail make him one of Chicago's greatest guitar stylists. Rush is also a stunning vocalist. His ability to equal with his singing what he achieves with his guitar playing has made his meager recording catalog that much more meaningful. Rush's career has not been blessed with good fortune. Whether because of bad business deals or plain bad luck, Rush has been unable to fulfill his potential as a recording artist. Unfortunate past experiences led him to become increasingly frustrated with the record business in the '70s and '80s and particularly wary of recording contracts that bound him in any way. As a result, despite his veteran status in the blues community, new Rush recordings have been few and far between. After Cobra's demise, Dixon took Rush to Chess. Though Rush was with the label from 1960 to 1962, it released only one of his singles, "So Many Roads, So Many Trains." The lack of attention at Chess prompted Rush to switch to the Duke label in 1962. He stayed with Duke until 1965; once again his total output amounted to one single, a tune called "Homework." Rush's future brightened some when five Rush tracks were included on the classic mid-'60s compilation Chicago/The Blues/Today! The album introduced Rush to white rock fans who had recently been exposed to electric blues. Mike Bloomfield of the Paul Butterfield Blues Band was so moved by Rush's guitar work on the album and in the Chicago clubs he played that he convinced the band's manager, Albert Grossman, to represent Rush. Grossman, who also handled Bob Dylan and Janis Joplin, got Rush a recording contract with Cotillion, the Atlantic Records subsidiary, in 1969. However, Rush's debut album, Mourning for the Morning, was a flop. Overproduced by Nick Gravenites and Bloomfield, who hoped to break Rush into the popular blues-rock field, the album failed to capture Rush's sparse, emotionally rich guitar style. Grossman tried Capitol Records next, and in 1971 Rush and Gravenites went back into the studio for Capitol and produced Right Place, Wrong Time, Rush's most inspired album. Incredibly, Capitol chose not to release it. In 1976, a tiny independent label, Bullfrog, purchased the album and released it, though by this time interest in the blues had receded to an all-time low and the album sold few copies. Rush kept his career going by performing club dates and occasional festivals, but there were no major recording sessions. At one point in the early '80s, Rush actually quit playing his guitar and settled into retirement. He returned to performing in the mid-'80s. But for dates outside Chicago, Rush used pickup bands- a questionable comeback strategy at best. Even the blues revival of the 1980s and early 1990s failed to resuscitate his recording career, though Rush continues to perform.